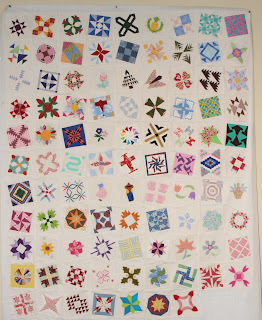 Smith Mountain Morning is first on the list of things I will finish before I start a new quilt. The pieced border is done. 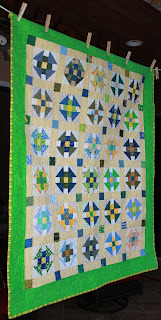 I think it just needs an inner border and then everything can get sewn together. That shouldn't be too hard, right? I will finish off a few things before anything new gets too far along. I am determined. I am not starting a new quilt right now. I just wanted to try out one block to see how it would look. I think bright might be the right word. 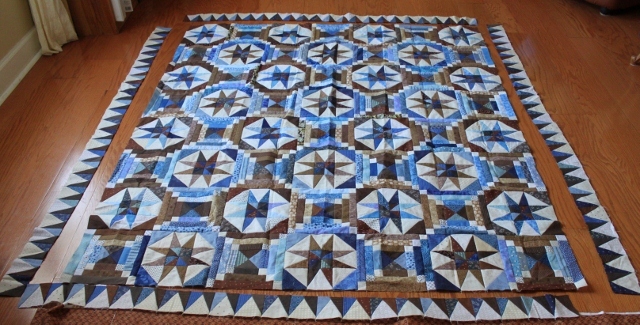 It will sure contrast nicely with the dark blue lattice strips. I'm not starting a new quilt yet. 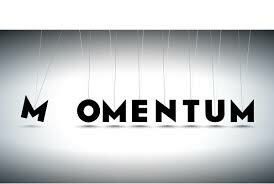 I am definitely going to finish off a few things first before I "officially" start something new. This isn't a start you see, it is just trying out a pattern. The geese are supposed to be 1.75 by 3 inches. That seemed kind of fiddly to do with the sew and flip method, so I decided to try drafting a paper piecing pattern. I drew it out on graph paper last night and made a few copies today at school. 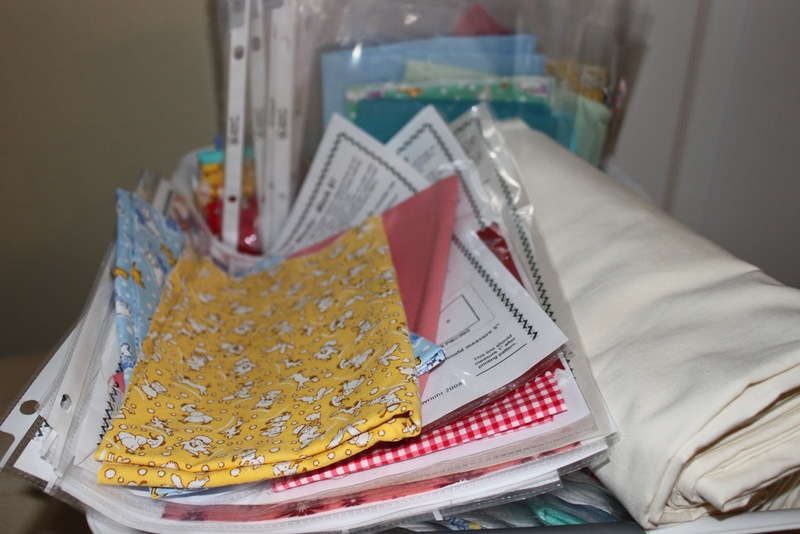 I don't have any official fabric picked out, since I haven't actually started yet, but I did dig through the scrap user drawers to find some things that might work. 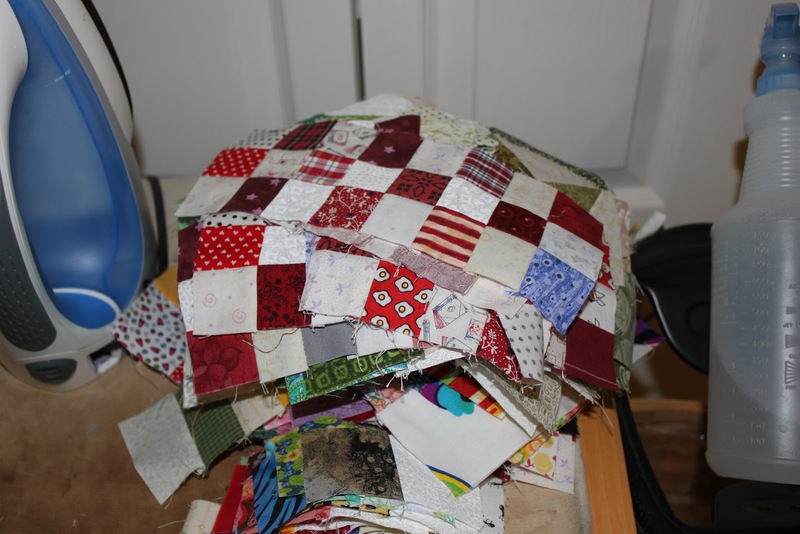 Tonight I might dig through the drawer of 2 inch squares and find some that will work for the nine patches in the middle. 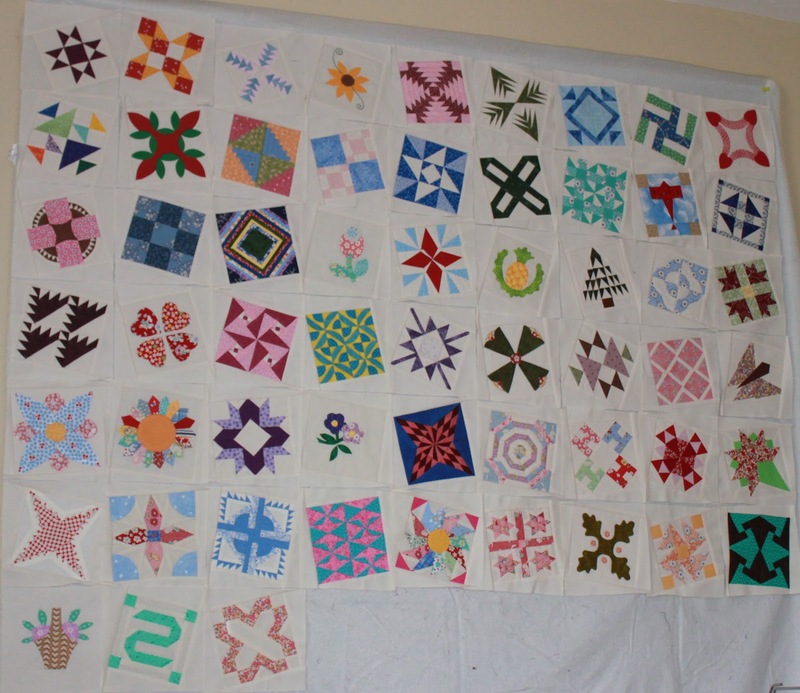 They will only be leaders and enders of course, so that doesn't count as starting a new quilt quite yet. 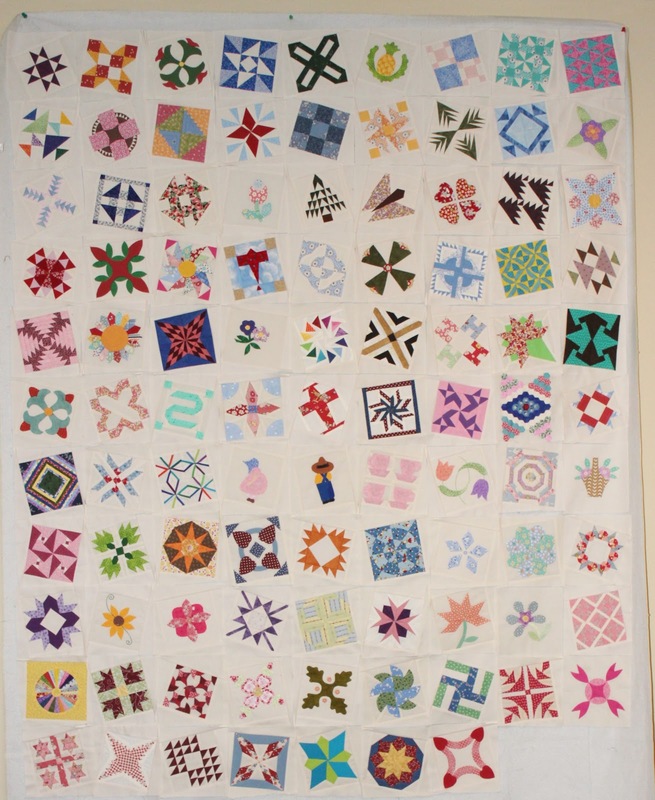 There are lots of people who have started the Hawaiian Sunset 1845 quilt. 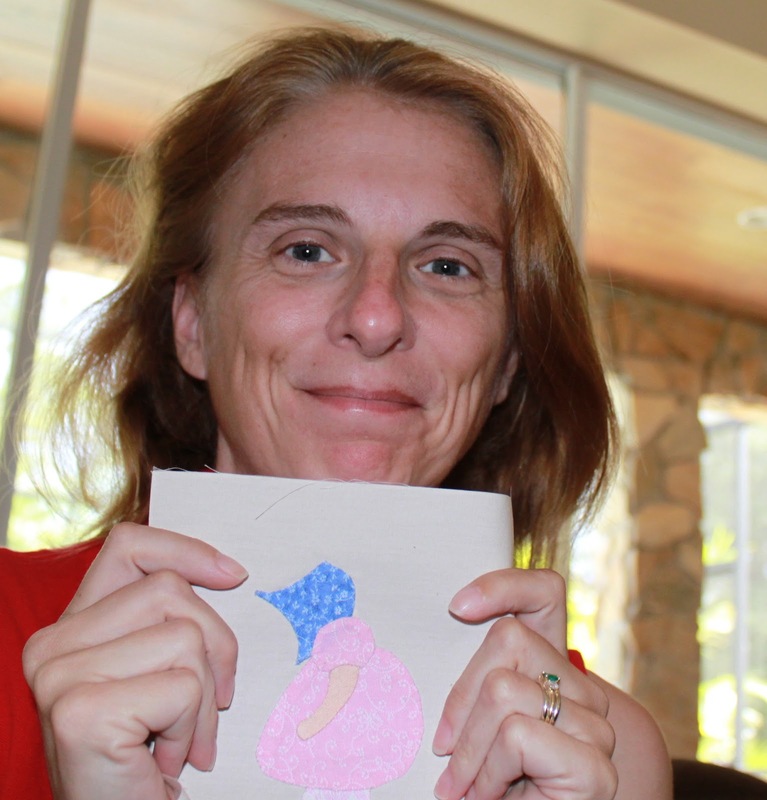 I resisted for a while because I have plenty of projects going on. Today I finally succumbed to peer pressure. 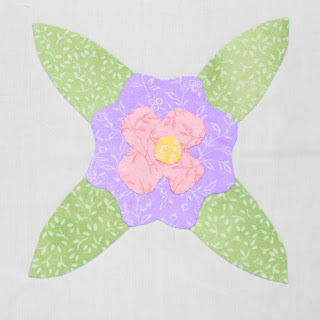 I just went to the Quilt Sew and Shop website and downloaded a digital pattern before heading over to Connecting Threads and loading up on fabrics in lime, avocado, pink and navy. I like the sites that let you shop by color or by theme. I won't start until a couple of projects on the list are done, but this one can go on the list for later. Maybe as leaders and enders? Time will tell. 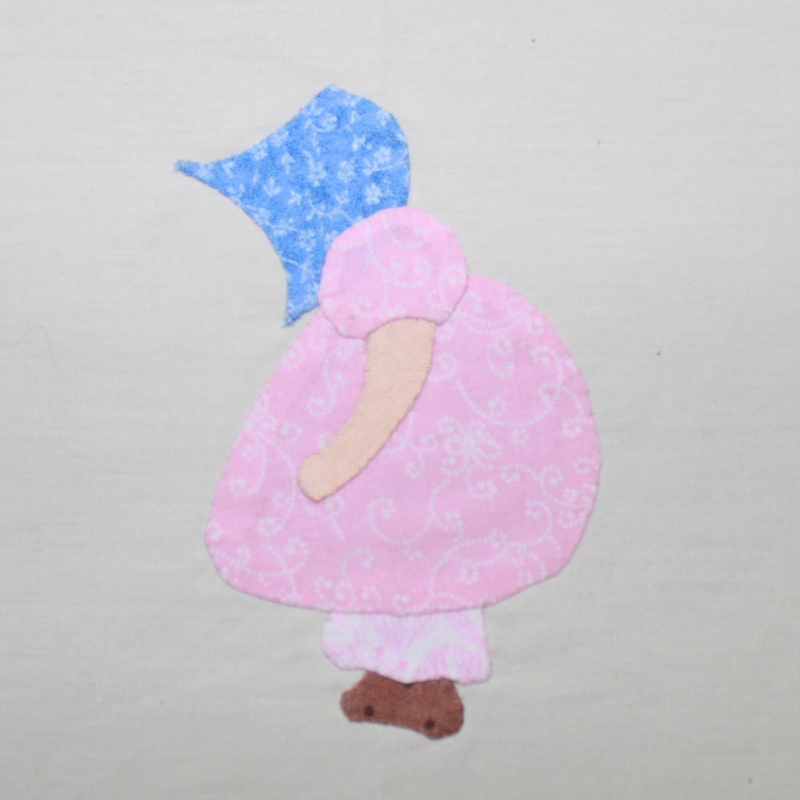 You can't have an Overall Sam without a Sunbonnet Sue. This one is officially just called Sunbonnet. There is supposed to be another bit of fabric on the front of the bonnet, and a ponytail hanging out the back, but I left those off. It is my block, I can edit it if I want to! I had just the perfect little bit of fabric for the arm. I don't usually have a lot of solids on hand, but I ordered a nice bundle from Connecting Threads that has been coming in very handy lately. In between marathon string block sewing for Jamestown Landing I did manage to get a few more Cherry Trees put together. 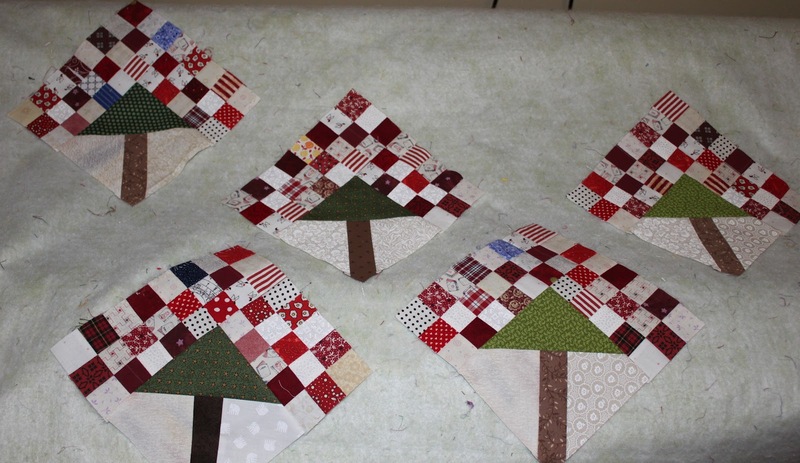 The pattern shows red lattice strips which would not work with my red trees for obvious reasons. I was thinking of purple and gold as a substitute. The green setting triangles will still work though. I'm not sure about the outer border. I have lots of nine patches left, but not enough of the red. Maybe multicolored squares? Time will tell. Right now we are slogging through rain from the outer bands to Isaac. It is going to be a wet day for sure. 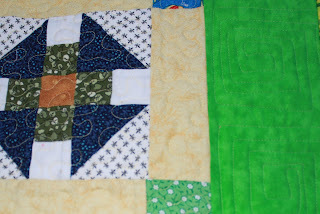 I found some time this week to stitch a couple more blocks of the Dear Jane Quilt. Slowly but surely it is getting there. Most of the weekend though has been nose to the grindstone power sewing of string blocks for Jamestown Landing. All of the Broken Dish blocks are done! 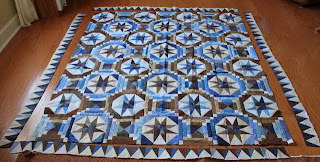 I'm at about 115 for the string blocks now, so just a bit more until it is ready to lay out. The kids are all off playing with friends. It has been raining off and on all day but it doesn't seem to have slowed them down at all. I'm pretty sure school will still be on tomorrow despite all the hurricane day wishes from the kids. I remember as a child waking up early on the morning of a snowstorm and waiting for the list of school closings to be read over the radio. I guess this is our own version of that ritual. After taking inventory this morning and catching up on ironing, I realized that all of the Broken Dishes units were done for Jamestown Landing. That lead me to start in on the string blocks which had fallen a bit behind. I was working my way through the second season on Downton Abbey while sewing. It wasn't on Netflix, so I signed up for a free trial of Hulu+. I am much more appreciative of Netflix now after spending most of the afternoon buffering or restarting. 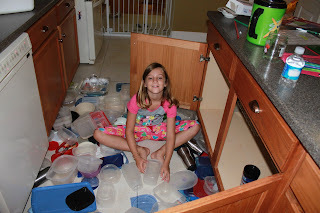 As I was making a mess in the sewing room, Anna was working on a mess in the kitchen. 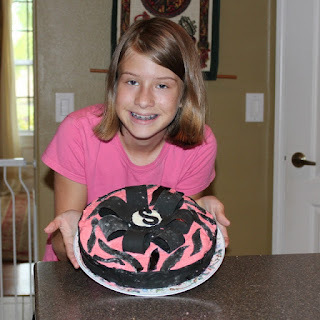 She had decided to make a birthday cake for her friend Sierra and somehow managed to scatter cake, frosting and fondant all over the kitchen. She was quite happy with the finished cake though, and cleaned up most of the mess. 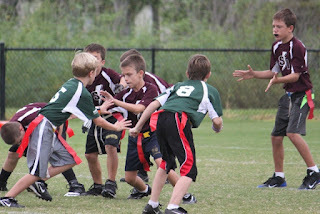 After lego practice Ryan had his first football game of the season. 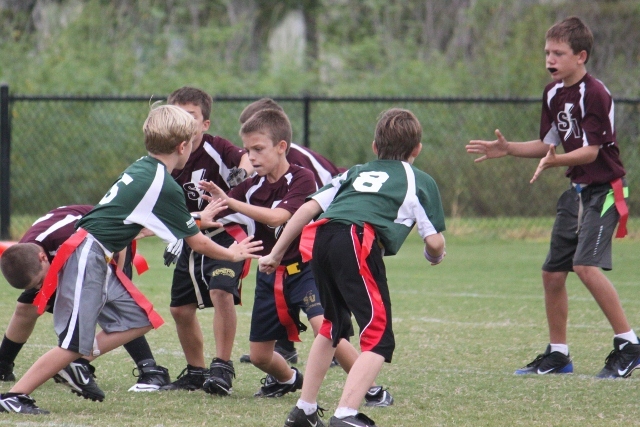 He is in a different league this year so that he could be on a team with his friend Troy. The new month doesn't start until next Saturday, so there are still several more days of teal time if you need to finish up, but this is the last weekend of August. 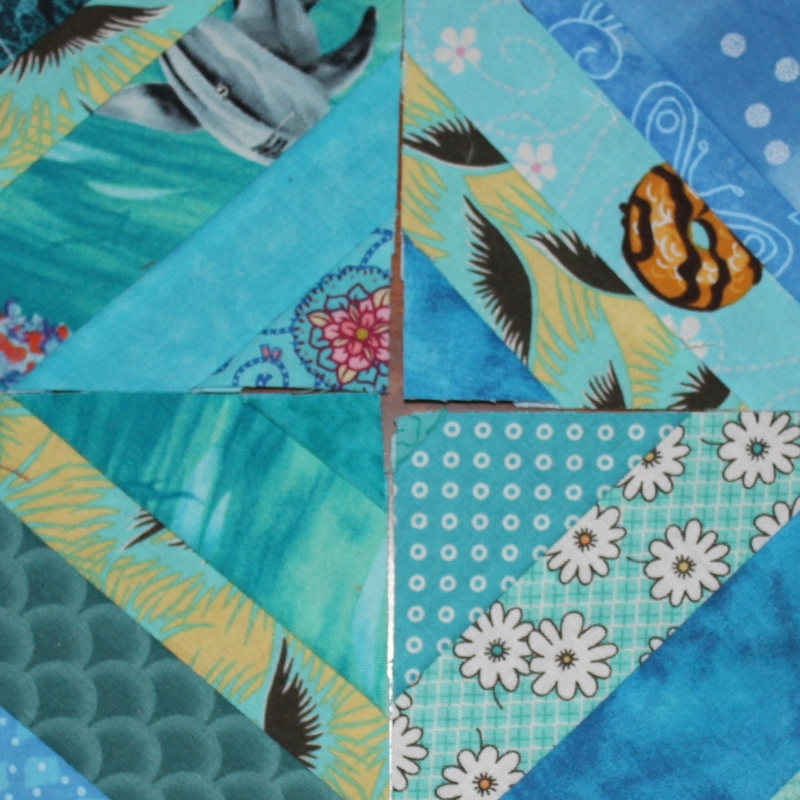 I made a BUNCH of teal string blocks for Orca Bay, maybe I should put the border together today? 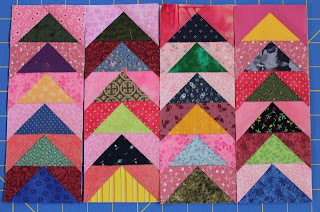 I've got border blocks ready to go for Smith Mountain Morning as well. Borders are always difficult for me. First I think I'll make a few tiny nine patches. Those are always fun and fast. What are your plans for the weekend? 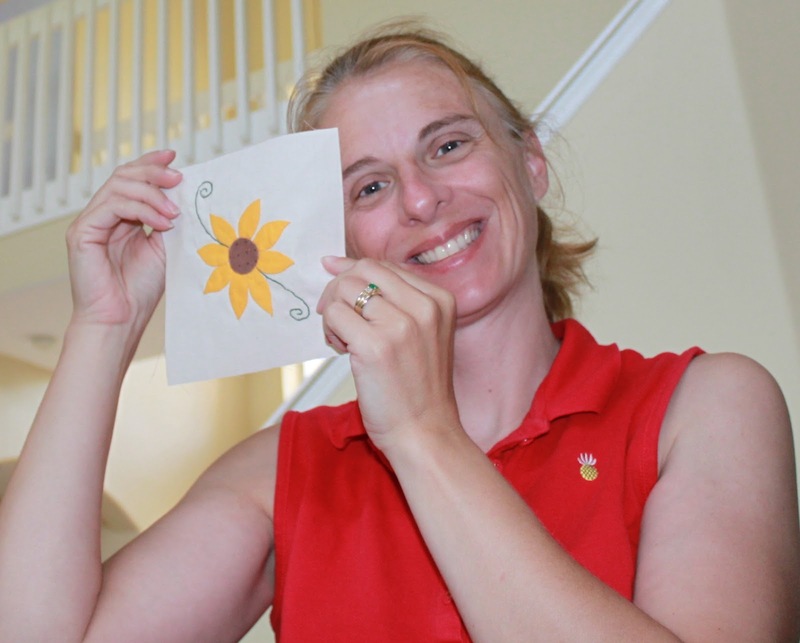 Use the Linky below to share your rainbow progress. Anyone else playing catch up this month? I was putting plastic bags over my classroom computer before dashing out for the weekend and pondering the possibilities for the days ahead. Despite the students best hopes of a hurricane day on Monday, I think the storm will stay to the west and we will all be back at the end of a normal two day weekend. Two days to play...ahh so many choices. More Midgets for the wall? More Apple Trees for the orchard? Maybe the rest of the Broken Dishes for Jamestown Landing? Or something new for the rainbow parade? There is a quilt on the frame and two more waiting for borders. So many choices, just two days to get it all in again. I knew I had more midgets than the ones on the wall. I worked hard to average one per week for the last two years, yet when I went to hang them up, there were only 99. Today I was digging through my basket of blocks in waiting to find another applique block to take to gymnastics tomorrow. 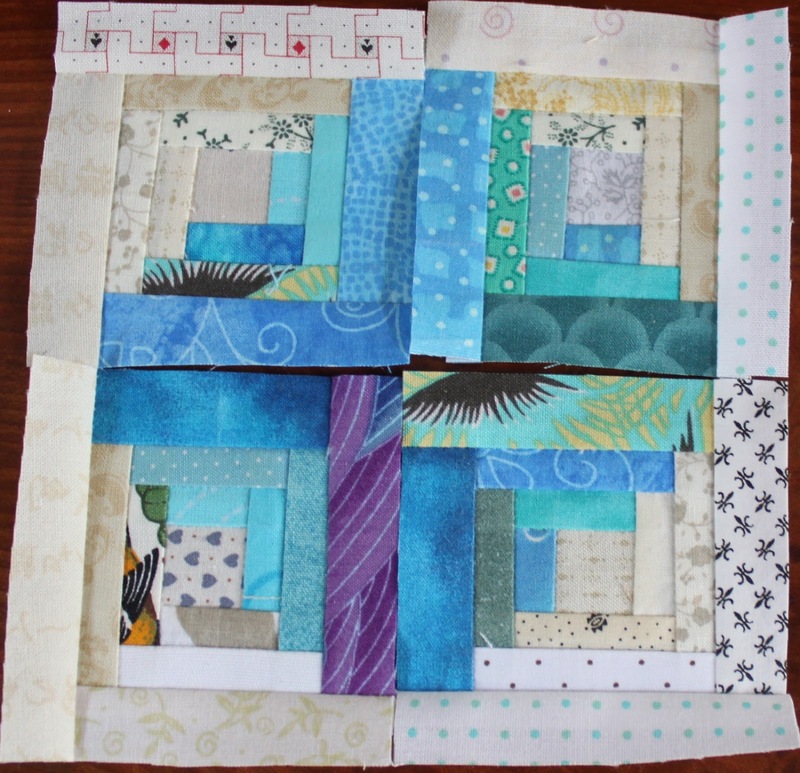 Low and behold, there were three finished blocks hiding amongst the patterns and fabrics in page protectors! They were done out of order because they were hand sewn. Those get done on long car trips and such. Other than those blocks I have been working in order. It is easier than choosing and procrastinating. The blue one in the middle is number 119 and it might be one of my overall favorites. I'll get these framed up and let them join the others on the wall. 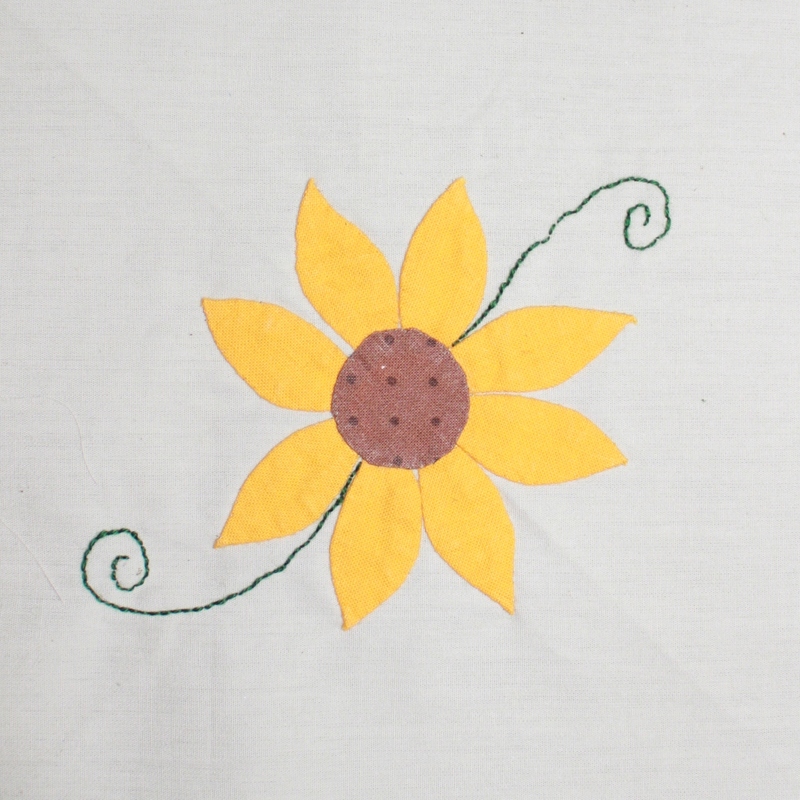 Until then, it looks like #81 needs some applique, so I'll get that one ready to go tonight. Sydney has been begging for gymnastics since one of our neighbors signed up last month. I voted no, but I guess I lost, because we start tomorrow. Kurt will be at football with Ryan which leaves nobody open to go the the 6th grade open house. Can't be everywhere at once though, so I'll just take a deep breath and move on with things. Happy humpday to you all. Congratulations on making it to the downhill side of the workweek. OK, how seriously cute is this little guy? Admit it, this is a super cute block. Getting everything to go together on such a super tiny scale was not exactly simple, but it worked. This is a block that just makes me smile. Austin volunteered to be my model for this one while he was here visiting this summer. 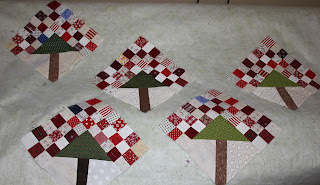 I added a few more cherry trees to the forest this weekend while sewing other things. All the parts and pieces are ready, they just need to be put together. 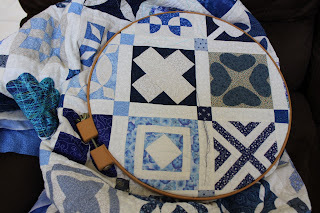 In the hoop this week, Dear Jane still in progress. 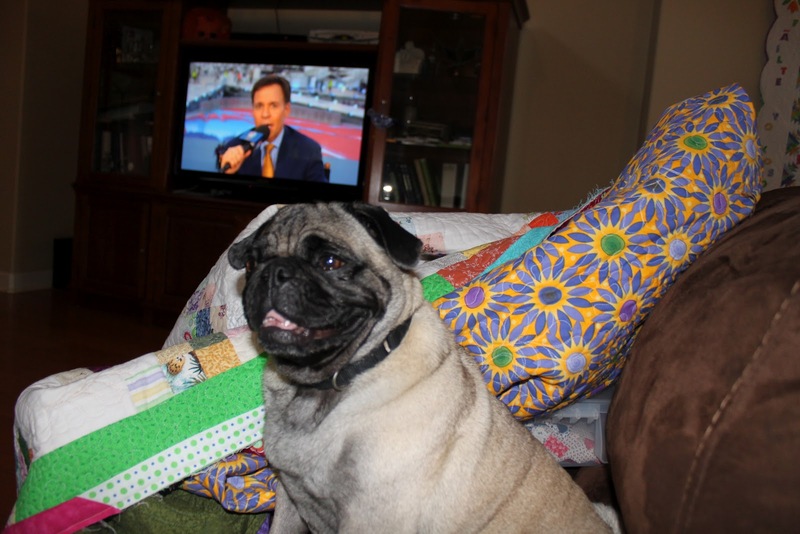 I have it ready for evening TV viewing with the family. 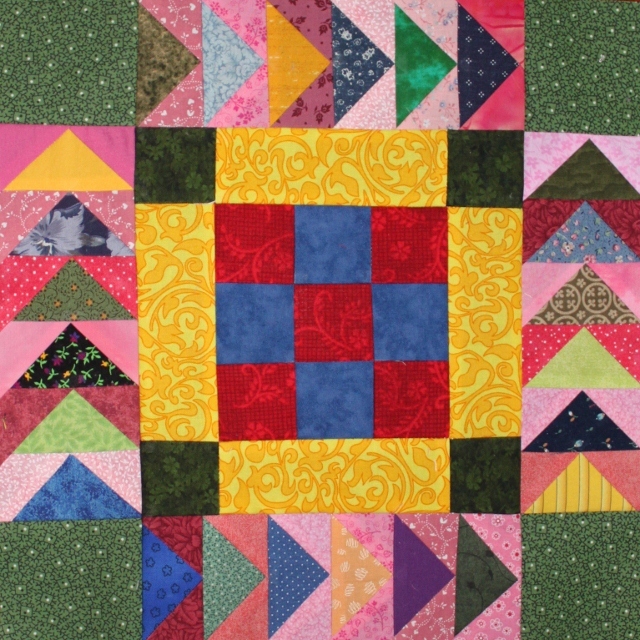 Hop over to Kathy's blog to see what other hand work people have pulled out this week. 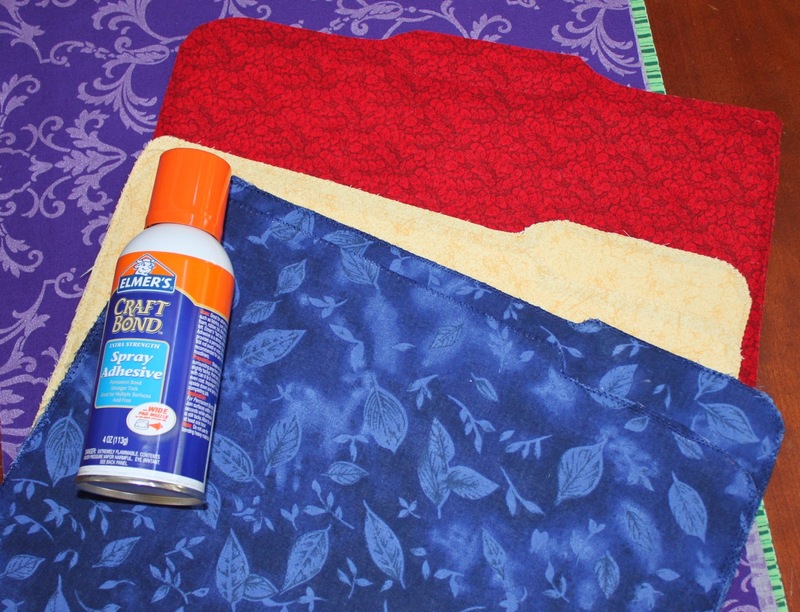 This morning I was making a few fabric covered folders for school. I made a set last year for "in" folders, but now I need some for "out". With two down and two to go, I ran out of spray adhesive! Not something I use very often, but it has come in very handy from time to time. I had promised to take the girls to see a movie while the boys were at D&D, so we were going to pop into Joann's while we were out. They had entirely torn apart the store for a remodel! The fabric was were the yarn used to be, the cutting counter had switched with the patterns an everyone was wandering around looking dazed and confused. I eventually asked someone who worked there where the glue was, but she didn't know either. Oh my. I hope they get it all put back together soon. Obviously we didn't stay to shop but grabbed the glue and escaped. 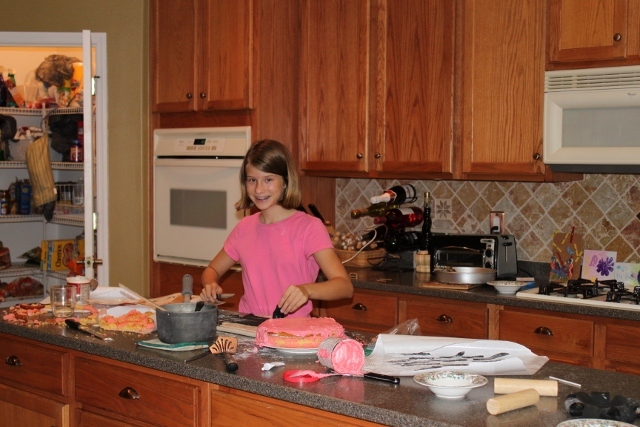 Back from the movie now, Anna has settled in to do a sewing project for school. Her science teacher asked if she could make a set of curtains from some tie dye panels that her students make each year. She did have me trim them to a consistent size, but the rest is all up to her. She is quite excited to be asked to do such an important job and is earning volunteer hours at the same time. I hope you are all enjoying some down time this Sunday. It is always nice to take a deep cleansing breath before jumping back into a new week. 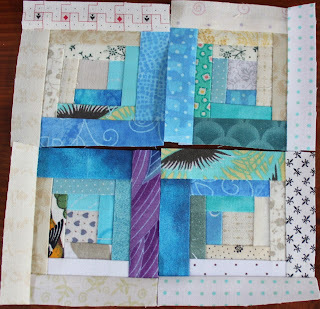 I was trying to work on the Crabapple squares today, but teal scraps were calling my name. I got sucked into Downton Abbey on Netflix while sewing. Sadly there were only 7 episodes, so those won't last long. I've managed to make a total mess of the sewing room as well, so that goes next on the list. Happy scrappy Saturday! 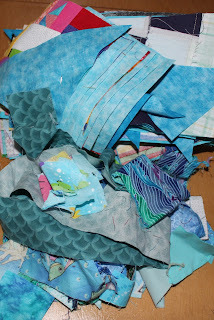 I am starting to hear that people are running out of teal scraps. I'm still working through mine with two more Saturdays to go. 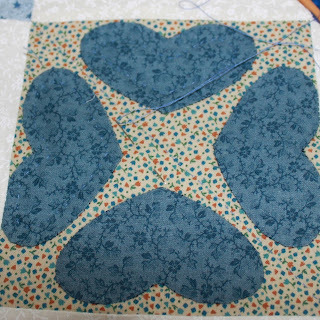 I should finish getting the teal crumb blocks put together. They were sitting nicely next to the sewing machine until they fell off the edge, conveniently falling into the bin of blue crumbs sitting next to the machine. There isn't a lot on the agenda today. 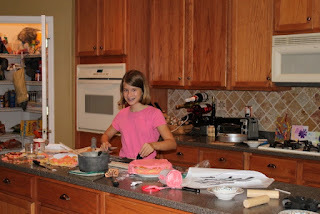 Sydney has Girls Scouts, Anna is working on a project for school. Ryan might have football practice, but his dad takes care of that. How about you? Lots to do in the garden and around the house? Use the linky below to share your teal, time is running out. Bonnie Hunter is having a web cast. 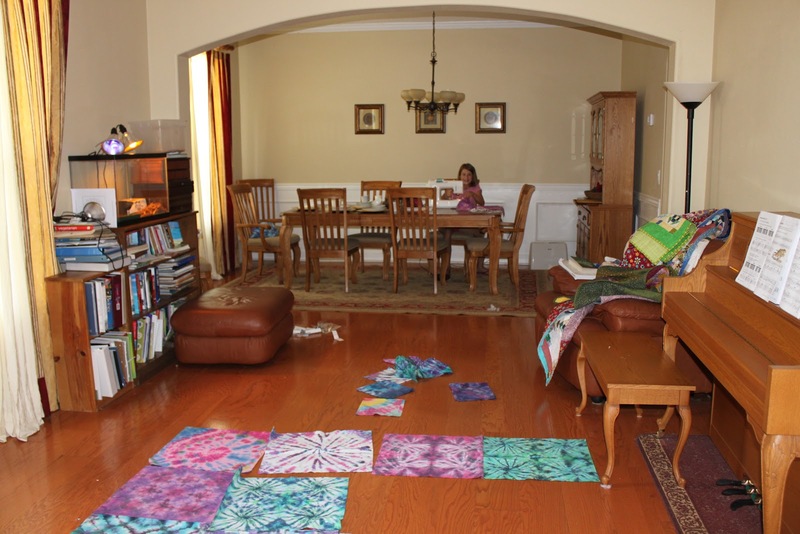 She is sewing borders for her Nearly Insane quilt. 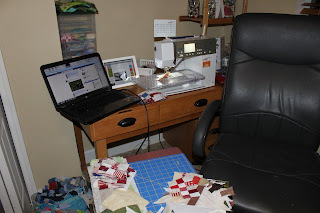 I am sewing crabapple blocks while watching her and chatting on Facebook with Andee and Amy. 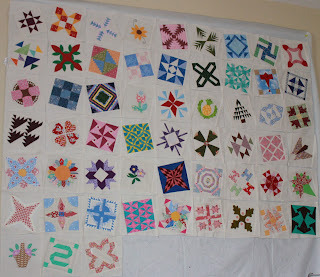 I am such an uber quilt geek! I've crossed everything off my list. AND even got to peek in on Bonnie's webcast by opening her blog in one window and my grade book in another. I'll be in good shape now for enjoying the weekend. 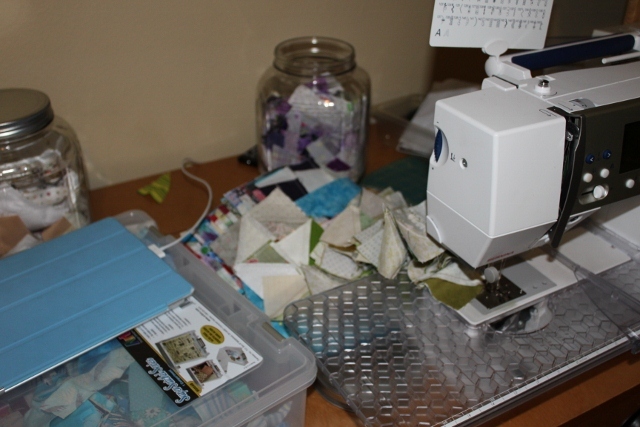 Right after Sydney's piano lesson tomorrow I start sewing until the wee hours. Life really is good. Just when I was sure nobody was going to guess, Deb came in with the right answer. 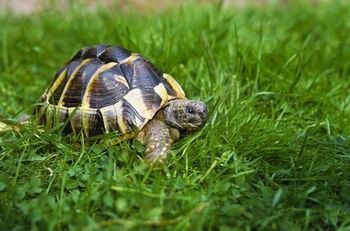 We are getting a tortoise! I have a student who breeds them, and he has been asking since the hamster died last year if we wanted one for a pet. I did a little reading and was a bit concerned about the LARGE size of the species that he breeds. He finally won me over though, by letting me know that he would be happy to take it back when it gets too big to be a class pet. Given the slow growth rate, that shouldn't happen for a number of years, but I like to have a plan in place. I hope I'm not emotionally involved by then and redecorating my back yard to accommodate another pet at home. Last night was back to school night. The one where parents go around to all the classes and you give the welcome back speech. My good friend Meisje was there doing her daughter's schedule as was my husband, doing Anna's schedule. It is so strange to see people I know outside of school starting to populate my workplace. It all seems out of context at first, but then it is so nice to see so many familiar friendly faces roaming around all day. We are getting a new class pet. There is a special surprise for the first person who guesses what it is. Nobody has it yet, but a couple got VERY close. In fact, if I weren't a biology teacher I would probably call it good enough. It is not the same though. Any new guesses? This is yet another applique block from the extra Midget series. 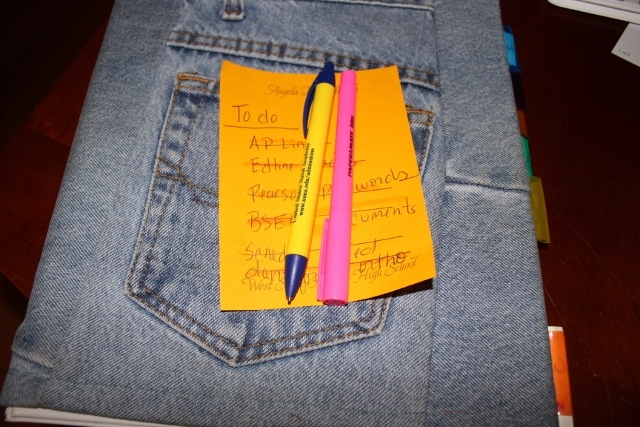 You are probably getting tired of reading the same post every Tuesday, but I am scheduling them way ahead of time in case things get busy with school. They do tend to do that, so I am planning just in case. I like the extra little green stitching on this one. It is a little wobbly due to being sewn in the car, but I like it nonetheless. Most of the weekend was spent putting Midget Blocks together. 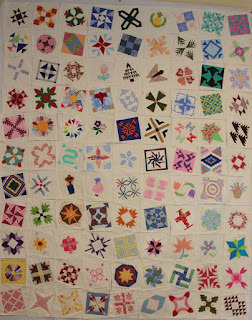 99 on the wall only adds up to a quilt that is about 54 by 66. I will keep going on those, there are still plenty of block patterns left at Sentimental Stitches. Last night I started doing some sorting and organizing. There are a bunch of nine patches that have been going in the background for a while now. 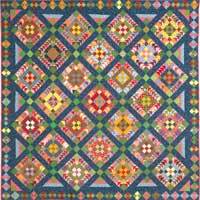 I picked out all the red and red with just one blue squares and realized that I have enough to make Bonnie Hunter's Crab-apple quilt. I'll call mine Cherry Trees, and put it on the list. Tonight we are going to watch the Olympic closing ceremonies as a family. While that is going on, I will sew the binding on the Irish Chain quilt. Lizzie is here to keep me company. First I'll have to fight her for the quilt. I think I'll win. 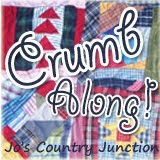 Be sure to visit Kathy and see what other handwork people are up to on Sunday. Thanks again for the reminder to stop and breath at least once a week. I was determined to get the last of the midgets sashed and up on the wall for admiration. 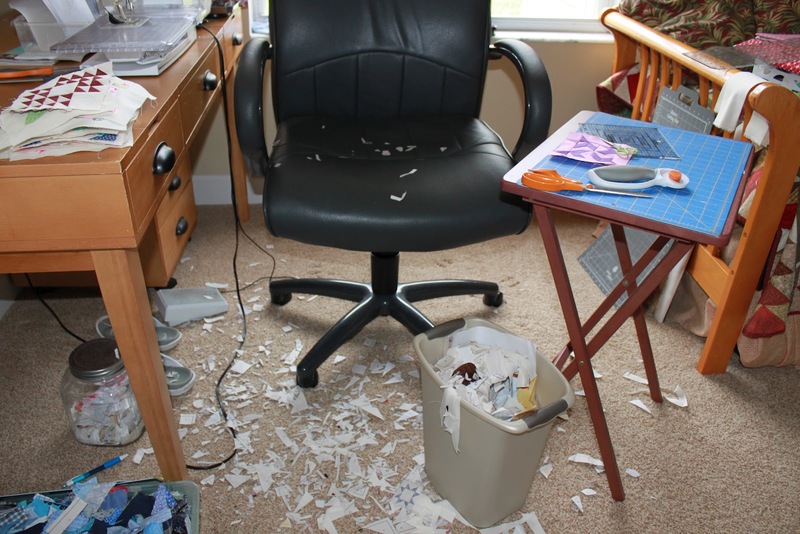 That meant individual inspections with time for paper removal and trimming. I was almost certain there were more than 100, but somehow only 97 seem to have shown up so far. I'll have to search in the morning and see where the others are hiding. Until then, it is time to call it a night. 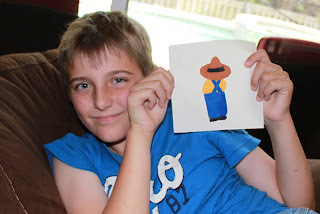 I am starting to wonder if my blogging is going to hop from Tiny Tuesday to ScrapHappy Saturday with nothing in between now that school has started. I hope once things settle down I will have time and energy to sew at least a little bit during the week, until then though, at least the weekends offer a little time for fun. What turquoise creations have you all been thinking up so far this month? I'm off to dig into my scraps and start turning them into something fun. 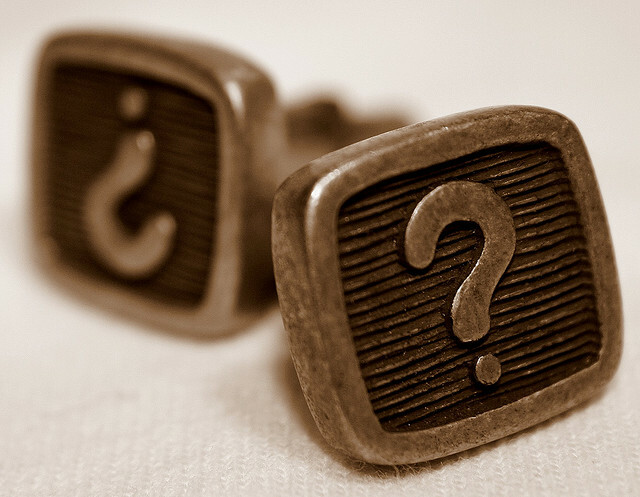 Use the linky below to show us know what you have made. 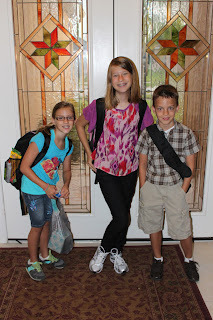 School started today with all the ceremony and excitement that a new year brings. 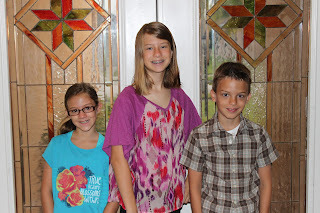 Today was Anna's first day of junior high. She is coming to school with me now, and seeing her face around campus during the day is such a nice surprise. Ryan thinks that 6th grade rocks, and Sydney ended up with the same teacher as last year and says it is like having the same year all over again. My classes all went well, though by the time 7th period rolled around, everyone looked SO tired. Getting back into the school schedule isn't all that easy I suppose. I'm pretty much wiped out too, adjusting to the new routine is going to take a few days. It is nice to start with a short week, by the time a long week rolls around we'll all be ready to move ahead full steam. I apologize for getting behind on answering e-mails, I am still reading, but responding hasn't happened much lately. This weekend should allow me to catch up again and maybe even sew a bit? I hope so. 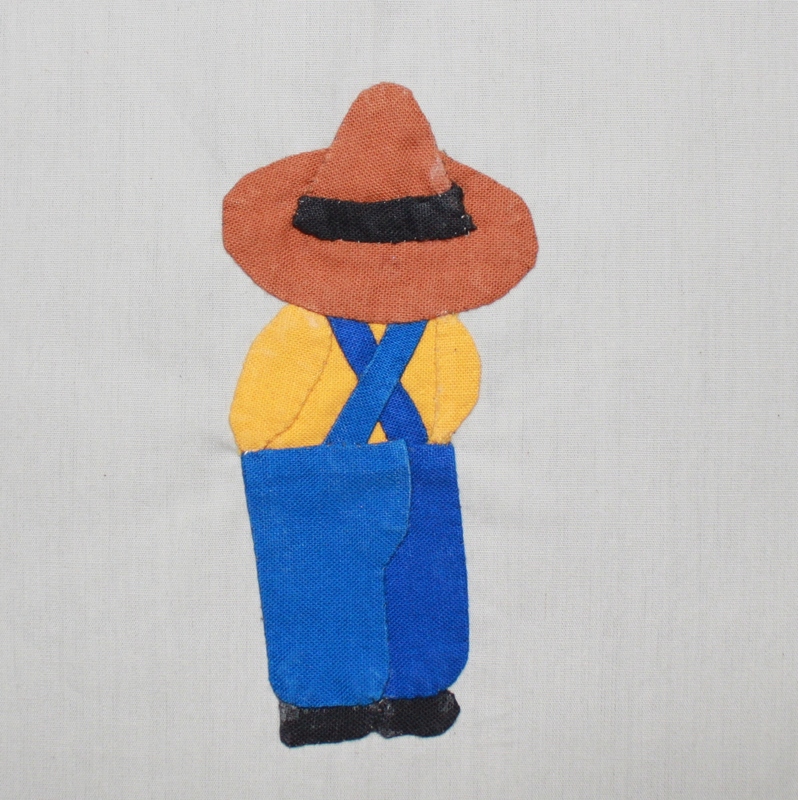 This is another applique block from the Midget series. It is called Flower #3, which is horrid name for a block. I think maybe it looks like a pansy. I guess I'll call it Playful Pansy. 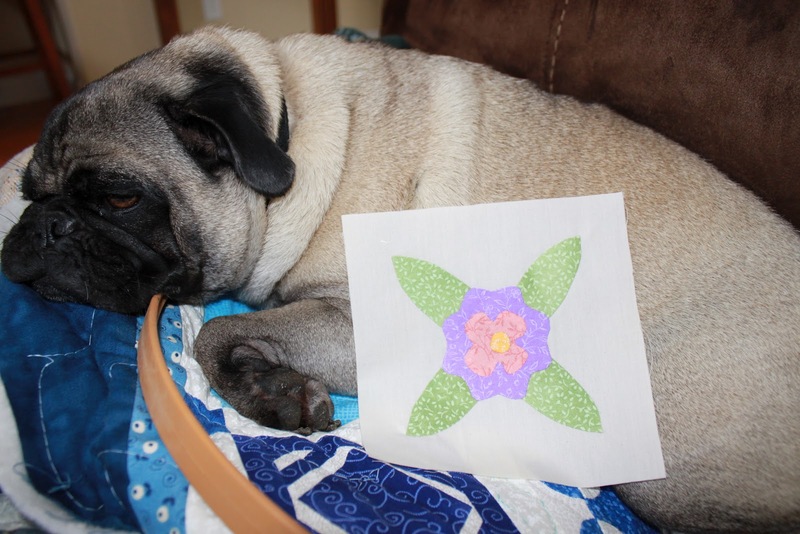 Here is Lizzie helping me quilt. Isn't she a great quilt assistant? 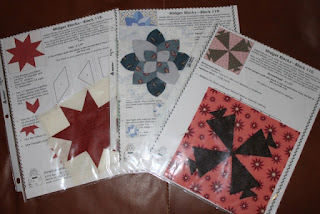 It's been two years since I started working on these Midget Blocks from Sentimental Stitches. I have about 100 done and am working hard to get them set in a cream background and up on the wall. 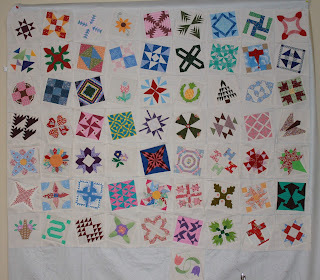 I thought I would have all of them up by now, but being back at school again is seriously cutting into my quilting time. No worries though, these little guys have been simmering for a long time, I want them to end up just right. Check out the Midget tab at the top to get a post on each block as it was finished. Maybe I will have them all ready in time for Tiny Tuesday this week? 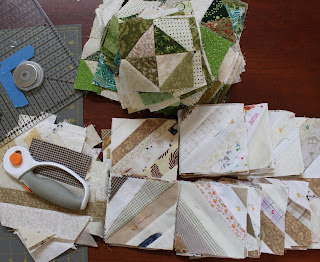 I've been so busy sewing bindings since the Olympics started that I almost neglected my Dear Jane Blocks this week. Today is Sunday though, and thanks to Kathy's hand work linky party, I remembered to pull her out again to take along to Sydney's piano lesson. It isn't a long lesson, but even a few stitches forward gets me further along than I was yesterday. I am determined to get this quilt done faster than my last hand quilting adventure which clocked in at 3 years and 7 months. 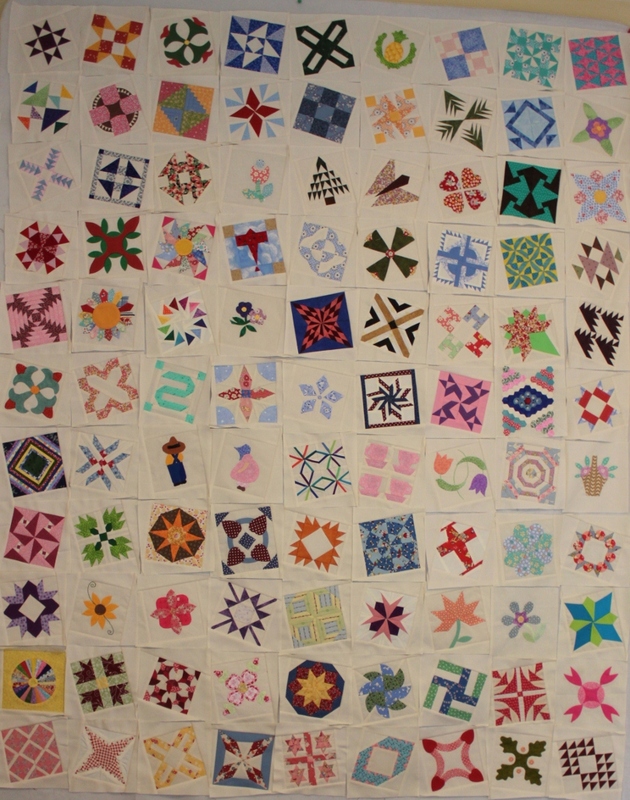 The Midgets aren't done yet, but I'm already thinking about my next big quilt. I'm not sure yet what it will be, but if it requires paper piecing, I will remove the papers as I go. I'm sashing out my blocks now, taking out the papers and checking them over. 57 blocks have made it to the wall, and a big stack is still waiting patiently. It is taking much longer than I thought, but I want to make sure it is done properly. Yesterday we got the kids to help with a bit of cleaning and organization. Anna cleaned the pantry. 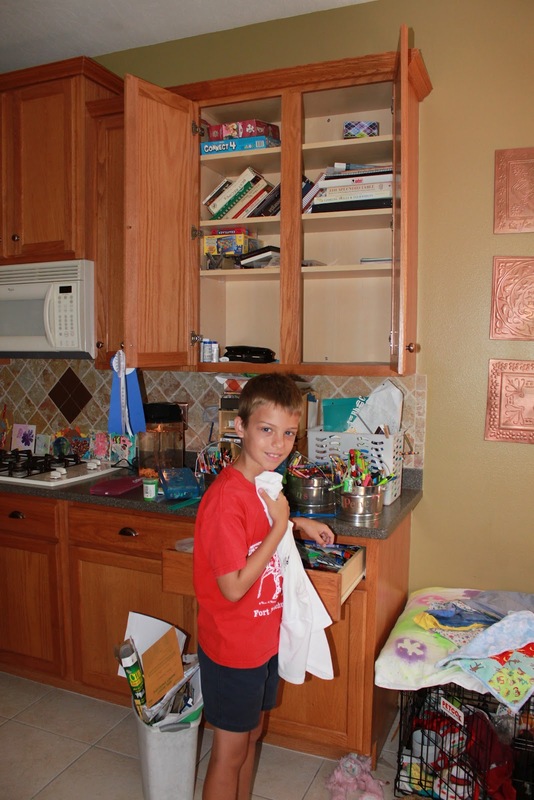 Ryan took care of the drawer that holds the kids school and art supplies. 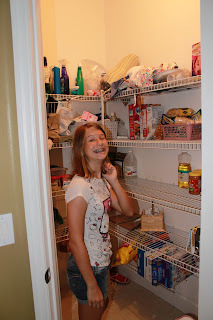 Sydney did the tuperware cupboard. They all did such a good job that we all celebrated with doughnuts when they finished. Today we enjoyed the last weekend before school starts with a movie and lunch out. Sydney has a piano lesson next, but after that I would love to get back to my blocks for a while. It has been two years since I started working on them and I am anxious to see them all together. 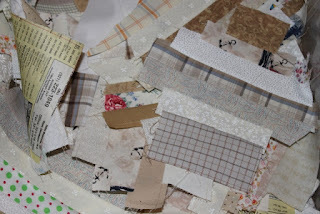 It is a brand new month for the rainbow scrap challenge. 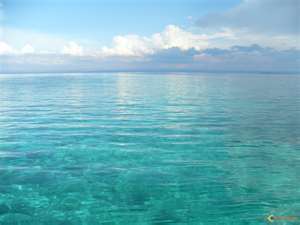 We are shifting from the true blue of navy and royal to the green end of the spectrum that houses turquoise, teal and aqua. I'm thinking tropical beaches with accents of sand. How about you? 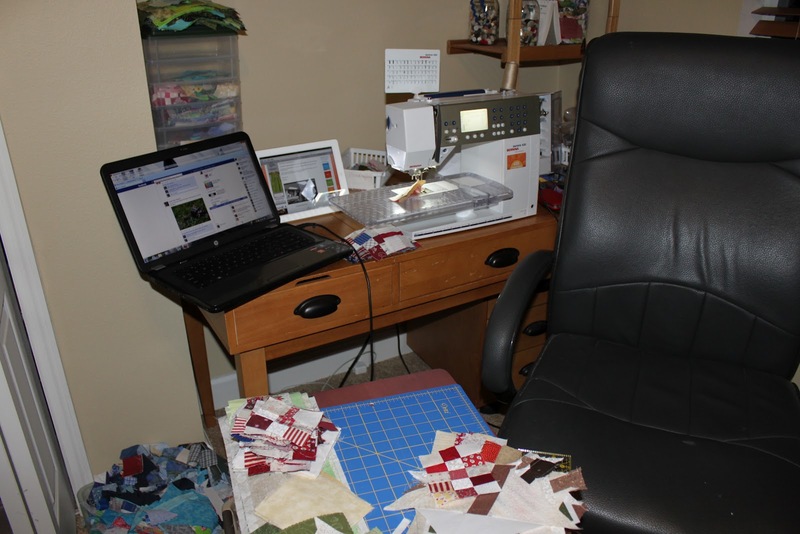 Being back at work is seriously cutting into my sewing time! Even if time remains at the end of the day, energy can be hard to summon. Sitting on the couch to sew some binding before nodding off during the Olympics has been just about right for the last few evenings. 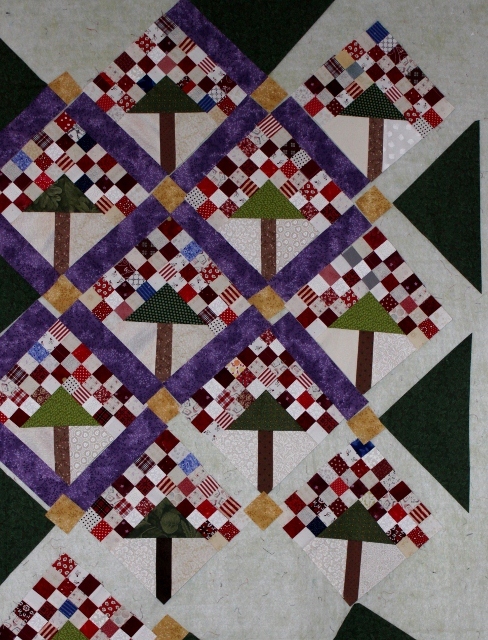 This quilt was based on Bonnie Hunter's Little Monkey Pattern. 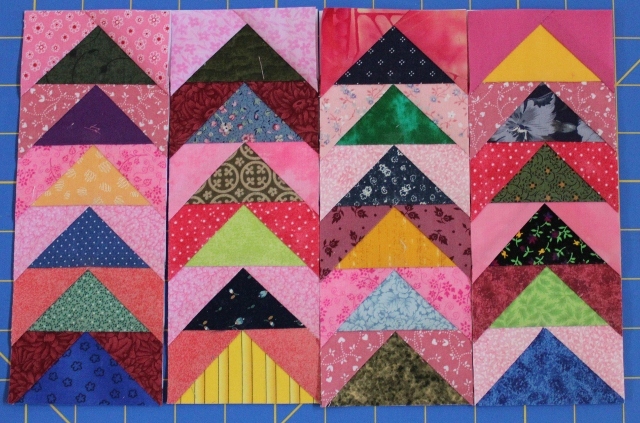 The blocks were all from the strip bins, with a bit of fabric added for lattice strips, border and binding. 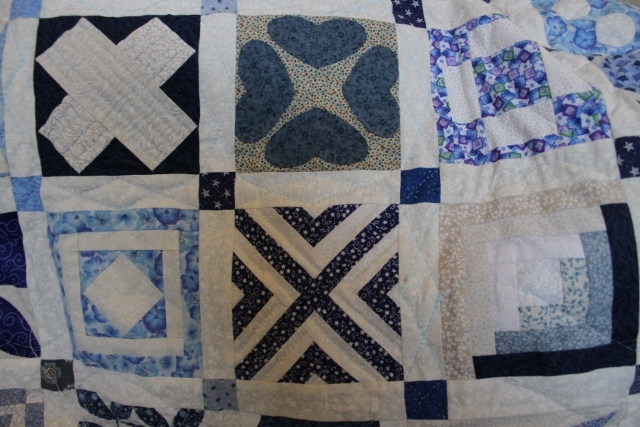 The middle is quilted with a small meander while the border has square spirals. I had fun with the edges this time, saving them for the end and then just rolling the quilt backwards and then forwards again, while quilting all around the border. It is a new baby gift for my mom's husband's daughter's new baby. Mom just got home from the hospital this afternoon after the reconstruction surgery following her mastectomy last year. Tomorrow is the first ScrapHappy Saturday of the new month. Most people have surmised that turquoise is the new color of the month. Look for anything on the greenish side of the blue bin, or if that won't work, try light blue as a substitute. For most people, blue is just too big to polish off in a single month. If you need to, just keep working of your blue bin to whittle it down a bit. Look for Mr. Linky in the morning so we can all find some inspiration in the new month.